Backlane Numbering – FREE Program! Do you live in the Chalmers Neighbourhood? Did you know only 23% of us have a back-lane address? These number plates are crucial for directing emergency services such as ambulance, police and fire department and By-Law enforcement when needed. This is one way we can improve safety in Chalmers, one of our five Housing Plan goals. 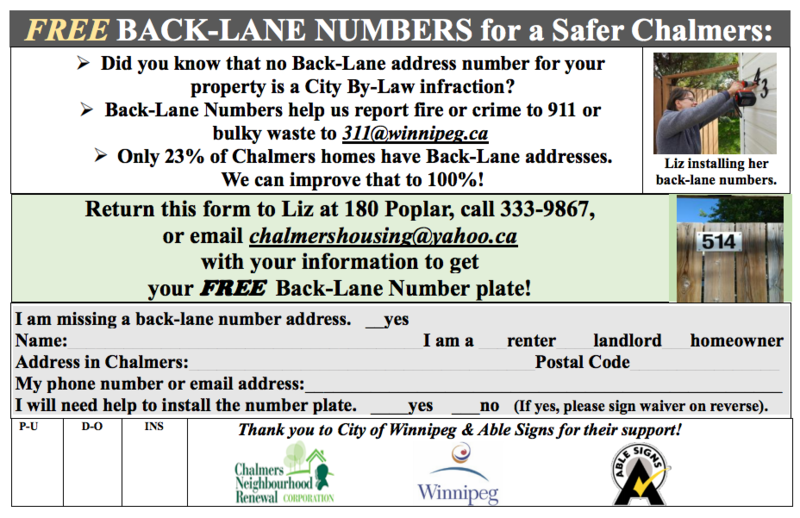 Chalmers Renewal has been approved for City funds to provide back-lane number plates to Chalmers homeowners! First make sure you are a Chalmers Neighbourhood Resident by checking out our MAP. Simply fill out the form and send it in!